Whatever the cleaning test, we have the solution. Daego has been focusing on the development of microfiber cleaning products for 40 years. With constant research and investment, Daego ensures top quality and competitiveness for its customers all over the world. Daego exists for cleaner, healthier living. We believe that all the people deserve cleaner, safer life and that belief has led us to what we are now, the global leading supplier in microfiber cleaning products. With desire to make top quality cleaning supplies, we spare no investments and efforts on R&D. Being recognized as a premium quality manufacturer, our products are exported to more than 60 countries worldwide and receiving favorable reviews from customers. Partnership is another value we care the most. We consider customers’ success as ours and are responsible for our product and service at all times. Based on the competitive price, we provide customized solutions for each customer. We work to grow our customers’ business and in turn, they grow us. R&D center is the heart of DAEGO. 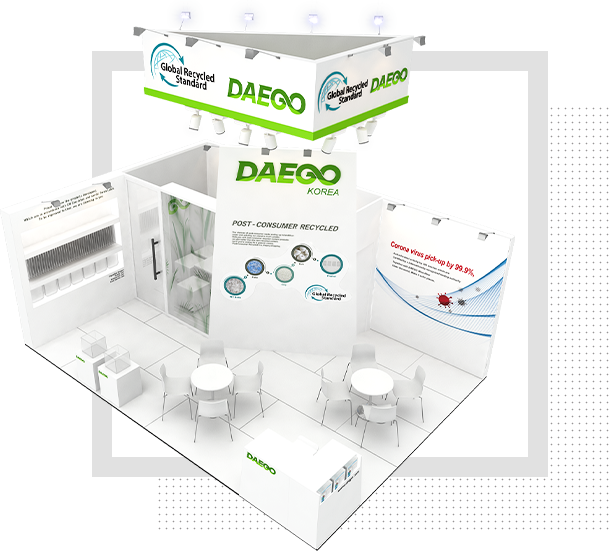 Daego creates the world of scientific cleaning. The Microfiber Manufacturer of SOUTH KOREA , Showcased Their Ne..
the online bulletin board and email.